Presidential Executive Fellow Rosetta Lue Joins Taylor Reach Group to lead Public Sector Practice | The Taylor Reach Group Inc. While The Taylor Reach Group, Inc., has been an industry leader in call and contact center consulting for more than 15 years, the main area of focus has been on establishing great customer care in the business sector, especially in retail and service industries. Although the company has worked with municipal and federal government agencies in the past, it is clear that the ever-expanding size and scope of public sector contact centers, as well as the unique needs of the people they serve, demand particular attention. Enter Rosetta Lue, a former White House Presidential Executive Fellow and Senior Contact Center Advisor to the Department of Veterans’ Affairs. In this role, Lue was responsible for leading the efforts to modernize and transform the VA enterprise contact centers to improve the veterans’ experience, targeting 1,800 contact centers processing 140 million annual calls from nine million veterans, their families, survivors, and caregivers. In addition to her contact center modernization efforts, Rosetta was selected by the VA Secretary to lead the project implementation team which successfully launched the U.S. President’s 24/7 White House Veteran Administration Hotline Contact Center Operations to track and monitor escalated Veterans complaints. Prior to relocating to Washington, DC, Rosetta was appointed Chief Customer Service Officer for 5th largest city in the U.S., Philadelphia, Pennsylvania and launched the internationally renowned and multi-awarded Philly311 Contact Center Operations. Under Rosetta’s leadership, Philly311 was a finalist for the international United Nations award for Public Service Innovation. Rosetta is a highly sought-after customer experience management thought leader and speaker. She is a widely acclaimed contact center innovator specializing in interdisciplinary expertise among the areas of culture change, knowledge management, performance management, employee engagement, human centered design principles, technology acquisition and implementation, journey mapping, process improvement, customer service recovery, community engagement, change management, training, data curation, business analytics, dashboards, and emerging technologies including artificial intelligence (AI). 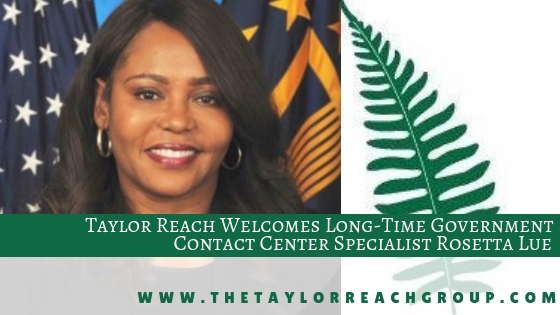 All of this makes her an amazing addition to the Taylor Reach team; a team that has, among other accolades, been recently recognized as among the Top 50 Customer Service Blogs and the Top 50 Thought Leaders (Colin Taylor) in the field of Customer Service worldwide by ICMI. About the Taylor Reach Group, Inc. – Established 2003, Taylor Reach is a worldwide, leading Contact Center, Call Center, and Customer Experience consulting firm. Taylor Reach specializes in optimizing centers, of all shapes and sizes, across many verticals, to deliver the desired Customer Experience: SMB’s, Fortune 500 and Global 1000 firms. Offering services such as Contact Center Assessments, Training Development, Sourcing, Workforce Management and more, Taylor Reach is dedicated to assisting clients to solve customer experience, Contact Center, and customer service challenges – clients have received more than 30 awards for service delivery and operational excellence.